April by the Prairie Schooler is finished! Isn't it just the sweetest! I used the same frame as March Daffodils .. I also mounted it on the same blue gingham as March ..I had wanted to do green gingham but the blue just looked better ! 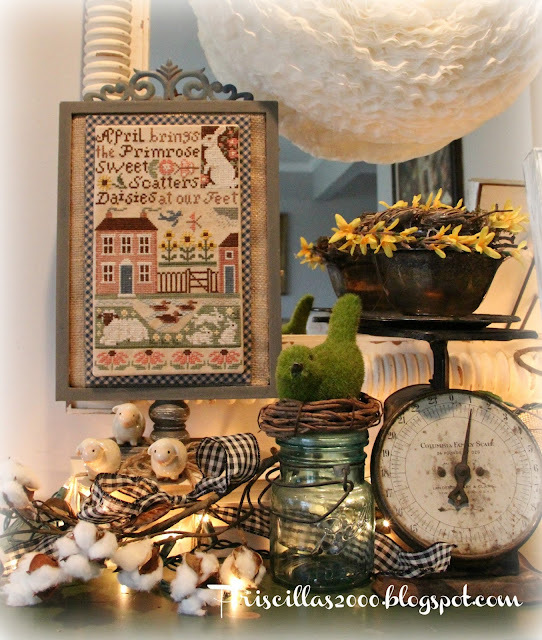 It's on display in the foyer with Country Cottage Needleworks April cottage.. Cotton branches ..mason jars ..the vintage scale and a pedestal plate..Mini moss bunnies and mini sheep added in for some cuteness! 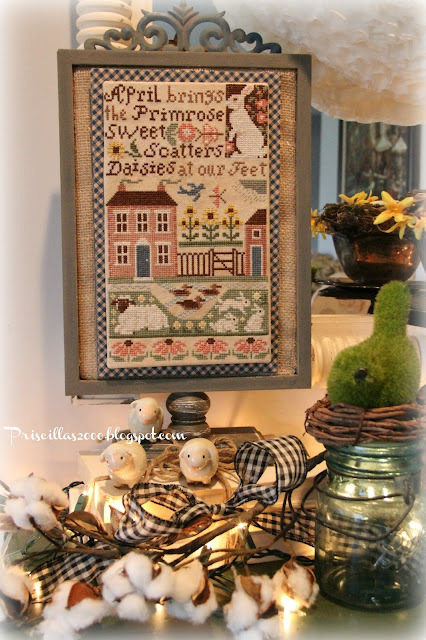 I'm loving the Prairie Schooler stitchery, reminds me of olden times and warm memories of home. I think that is why I enjoy your blog. I love the way you display your monthly projects. It gives all of us such great ideas! That's a charming sampler! I am going to start practicing my stitches. Thanks for the inspiration!! Yes, this is a precious one. Perfect stitch, composed in the perfect framing job and sitting in the perfect setting! I think the April stitch is my favourite so far, with its pink colours and little bunnies. I also love those precious little ceramic lambs! 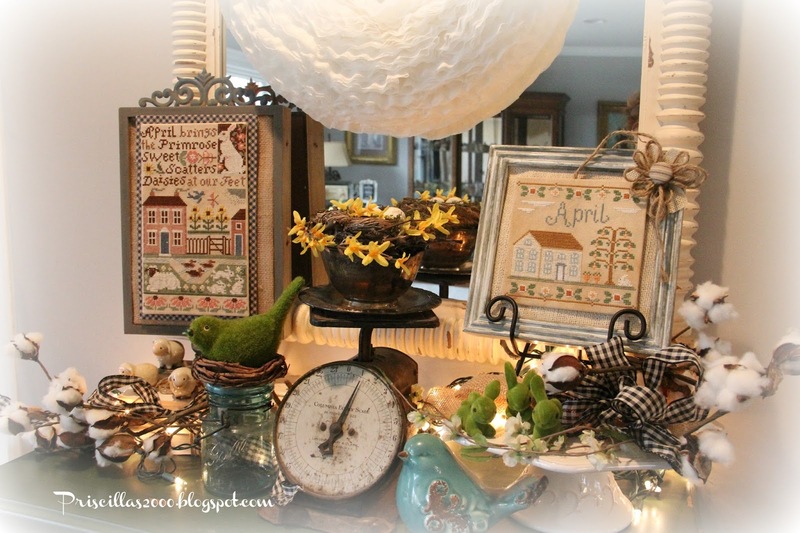 Your April Sampler is beautiful and so is your display. 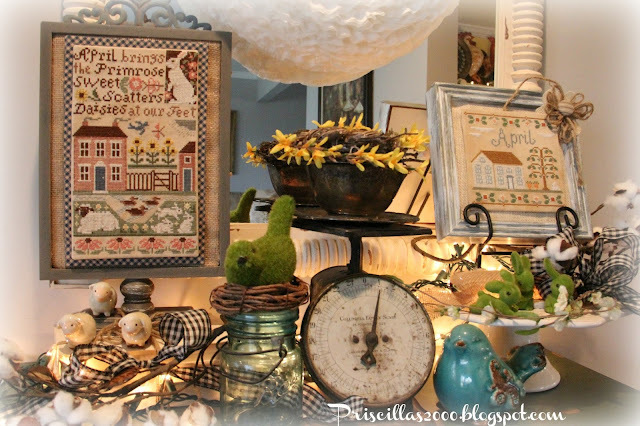 I love the way you framed that sampler. What a pretty display. 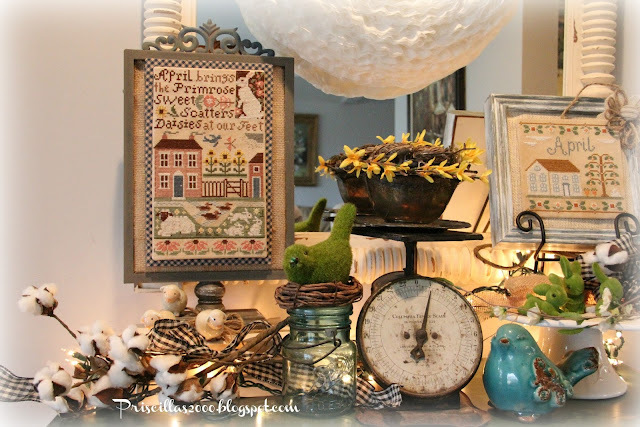 I love the way you have such a sweet display each month - you are very inspiring! !